Not sure if I've ever taken a detail shot of the black swans atop the pedestal lamps on the Horseshoe Bridge constructed in 1904. Waiting at the traffic lights to cross over from Yagan Square to Northbridge there they were, looking down at me.. click! If you find Aboriginal mythology interesting you might like to read the story of how the swans transformed from white to black here. Happy Thursday, take care and stay safe.. It's a great day to be a pirate aaargh! Even pirates have to eat and when chairs are spare that treasure chest will do nicely me hearty! In the words of the gorgeous Marylin Monroe 'it's all make believe isn't it'. Spotted the delightfully whimsical, but perhaps with a deeper meaning, mural on Progress Street while in Morley a few weeks ago. Painted by Perth artist Steve Buckles aka Hurben back in 2015. I love every detail of it but the tiny blue slippers were an enchanting touch :) Hope your week is off to a happy start, take care and stay safe..
Skyworks 2019.. A baker's dozen. I didn't make it to Skyworks this year but my BIL has once again very kindly let me use his shots of the night. A little bit tricky as there were 100 to choose from, picking my baker's dozen wasn't easy. They were taken from the South Perth foreshore looking across over to the city. I'm not sure what format Bill shoots in but these pics took a seriously long time to download, hope you enjoy and merci beaucoup once again Bill. Happy Monday, take care and stay safe.. In the city yesterday to meet up with friend and fellow Perth blogger Sami and just arrived blogger from Braunschweig, Iris and husband Ingo. So much going on in the city with Australia Day celebrations in full swing. P and I didn't stay for the fireworks this year but after a walk around Elizabeth Quay in the early evening we have our spot picked out for next year, as did the flotilla of boats in all shapes and sizes waiting here. Australia Day, known to a growing community of Australians as 'Invasion Day', the day 231 years ago when the First Fleet landed in Port Jackson. I'm disappointed with our PM's speech today lamenting that the 26th Jan 1788 was 'pretty miserable' for his ancestor, of course for the new arrivals it would have been tough, but for the Indigenous Australians even tougher. Seriously it's time.. what's the problem with celebrating a week earlier, a week later, whatever.. change the date! Happy Sunday, take care and stay safe.. Heading into the city today to catch a few of the Australia Day celebrations. According to statistics Perth now rivals Melbourne for its ethnic diversity, as also shown by the flags on the Perth sign sitting below the Yagan Square Digital Tower. Took these shots on Thursday, you wouldn't think we were in the middle of summer, we have been so lucky with cooler temps here in the West compared to most of Australia, but... February, the hottest month is only a few days away and Fringe World is in town, it's always hot when Fringe is in town 😉 Bon weekend, take care and stay safe..
No I'm not talking politics I'm talking fabulous Fringe World fun! From the 18th January to 17th February the third biggest Fringe in the world will delight Perthites and visitors with entertainment of every genre. 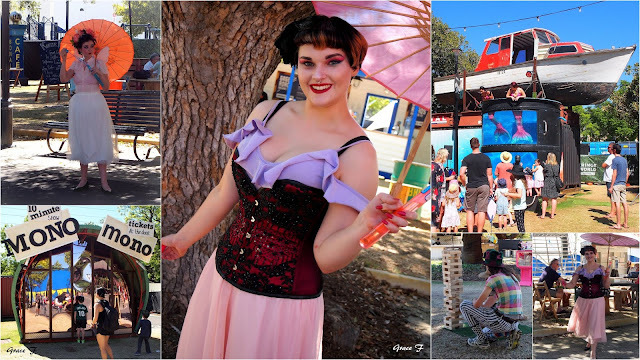 All about variety and offering something for absolutely everyone the Fringe line-up 'includes comedy, circus, free and family entertainment, theatre, visual arts, musicals, dance and cabaret presented by Western Australian artists along with performers from all over the world'. Below Fringe's newest venue Yagan Square, have a look at the events here. All quiet through the day, this area will be chock-a-block in the evenings.. when we get around to choosing what to see we will join the throng 😉 Happy Friday, take care and stay safe..
For the last few months I have been woken up at sunrise, 5.30, by the elusive laughing kookaburra above. Not that I mind, in fact it's rather lovely to lie in bed and listen to the various bird-life in my area waking up. Despite the name the butcherbird has one of the sweetest songs, listen here (cut in to about 2min47sec to get the group sing-song). Then there are the mudlarks and the wattle-birds. A veritable symphony of bird song. Have tried to catch a shot of the kookaburra returning with a mouthful of food for it's family many times but by the time I get my camera pfffft it's gone leaving behind the echo of a mocking laugh to taunt me. Sitting on the patio at the weekend he was so intent on his prey below.. I have to be honest it was P who spotted him high up in the tree next door but at last.. gotcha you little mocker 😉 Happy Thursday, take care and stay safe.. P.s. don't look too closely, he was a looong way away! 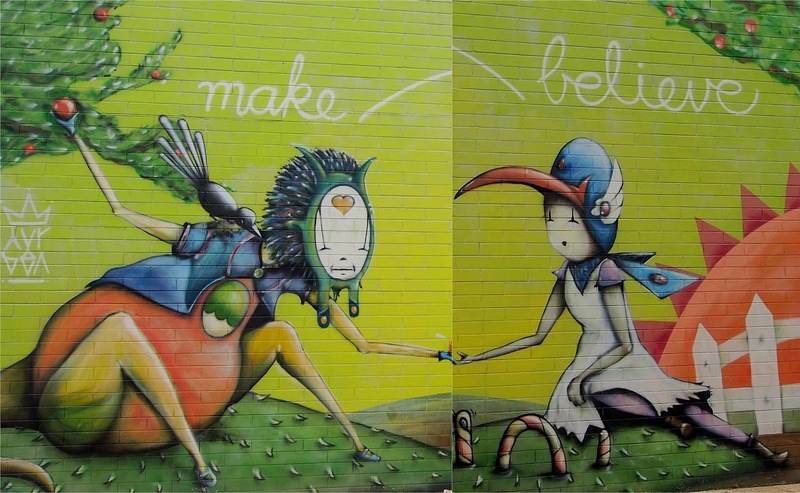 York road trip.. Dreamtime story. 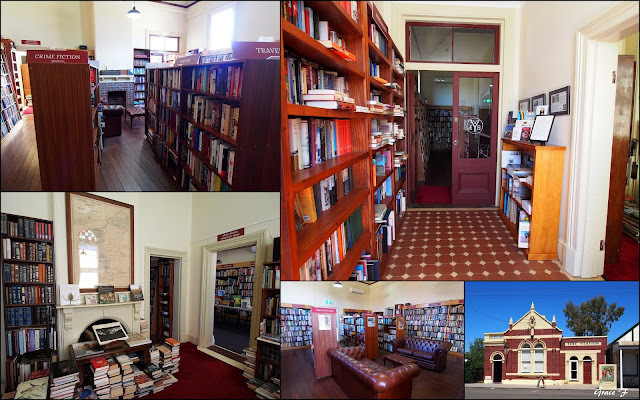 York road trip.. Barclay Books. Books, books luvverly books! Dealers in new, used and rare books Barclay Books, housed in the old York Fire Station is a haven for bibliophiles. I am a minimalist in every other area, well perhaps not art, but don't ever ask me to minimize in the book department 😊 I know I'm not alone when I say there is something sublimely comforting knowing there is a world of unread books out there waiting for me :) On this visit I took home a limited edition, English translation, leather bound selection of stories by French author Colette, including her novella Gigi.. can't wait to begin! 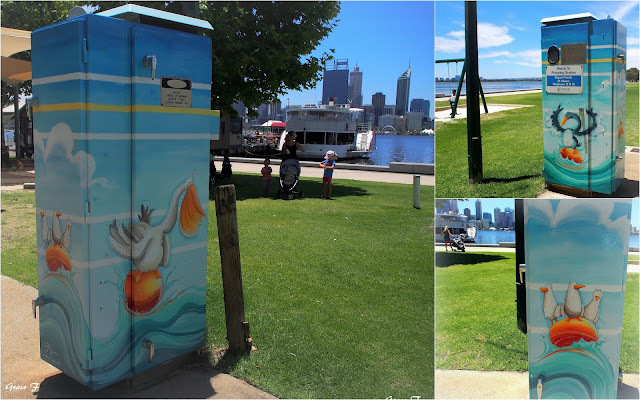 Happy Tuesday, take care and stay safe..
Like other cities around the world the WA Water Corporation's Splash of Colour public art series has brightened up pumping stations around Perth.. you might remember seeing a few others here on the blog. This delightful 'crew' was enhancing the pumping station near the Mends Street Jetty in South Perth. The group of jolly birds, all living on and around the Swan River were painted by Peter Ryan who's wonderfully whimsical art you last saw on the blog here. Love the daffy black swan dancing like no one is watching :) Hope you had/are still having a good weekend, happy Monday, take care and stay safe..
York road trip.. Flower power. Unfortunately we ran out of time to explore the York Motor Museum this time, I took the quick click above as we passed but if you are a lover of vintage cars it's worth a look inside here. The juxtaposition of old vehicles in the museum and new cars on the street appealed, plus I thought how much fun my grandchildren would have in the vintage toy car centre stage and myself in the 🌼 power beauty complete with hood ornament to the left, too cool! I hope your weekend is going well it's a wee bit hot here in Perth, but only for the weekend so I've heard. Happy Sunday, take care and stay safe..
York road trip.. Town Hall. The York Town Hall, built in 1911, is a grand old beauty built in a mix of architectural styles of that period and sits proudly on York's main street. 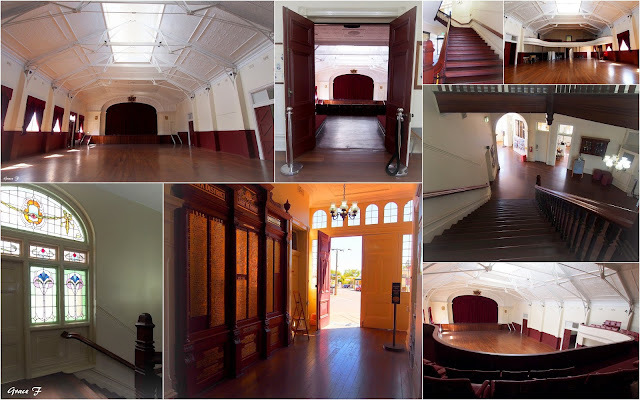 I was thrilled to be able to go in and explore the heritage listed town hall and was not disappointed! If you click and read the link you will see that it has quite a history. Condemned in 1926 later restored to it's former glory in the early 2000's with many a trial in-between. There was a peculiar incident while I was sitting up in the balcony seats looking down to the stage.. I don't consider myself particularly intuitive in the awareness of anything 'otherworldly' but I felt a definite chill, enough to make me head down the gorgeous jarrah staircase tout suite :) I found out later that back in 1933 while at the St. Patrick's Ball a young man standing on the railings of the dress circle unfortunately fell, breaking his neck on the dance floor. Apparently I'm not alone in feeling the chill.. spooky huh :) Happy weekend, take care and stay safe..
York road trip.. Wara Art. Every now and then it's good to get out of the city and into the great outdoors. The last time we were here the York Cycling Festival was in full swing and the town was way too busy for serious exploring. Yesterday on the way to Northam to visit P's brother we stopped to have a proper look around. The first thing I spotted, hard to miss :) was the giant Bilby constructed during the Hay Bale Challenge at the end of last year. The huge straw sculptures of endangered species are created in the Japanese style Wara Art (interesting link). If you are interested you can read here how these incroyably detailed straw sculptures came to be here in WA's oldest inland town. Much more to show you when I've edited the many shots taken. Happy Friday, take care and stay safe.. P.s. They are holding up pretty well considering they've been here since September last year! It may only be a young and slightly spindly Illawarra flame tree but it packs a visual punch as you walk down Hay Street. Seriously.. how fab does it look against that super blue sky! In a few years time that will be a proper stunner. A stones throw further down Hay St. the plane trees in Central Park gardens provide a green canopy of shade from the summer sun. All in all not a bad little stroll into the city. Happy Wednesday, take care and stay safe..
Zipped over to Morley early yesterday morning to take some of shots of a brand new mural before the car park filled up. 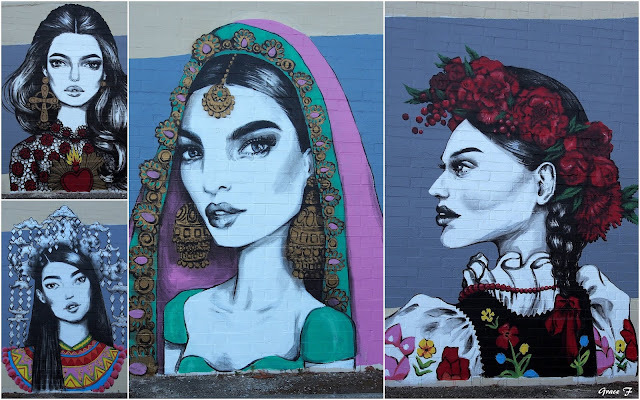 The mural a collaboration between one of Australia's leading fashion illustrators Pippa McManus and the Morley Momentum. The artist has created 'a vibrant mural reflecting the diversity of the local community, the top five ethnicities according to the census being Vietnamese, Italian, Indian, Malaysian and Polish families'. The artist 'has incorporated traditional costumes of those five cultures, each costume has been researched and combines modern and traditional details.' You might notice above to the left the 'Acknowledgement of Country' to the Indigenous Australian people the Whadjuk Noongar, a thoughtful, if somewhat ironic touch. Hope your week is off to a good start, happy Tuesday, take care and stay safe.. It's the little things in life..
My what big teeth you have.. Happy New year.. Let's Do It!